Charging your phone in a dark environment is easier than ever with CordLite. The perfect amount of light, when you need it. 1,231 backers pledged $73,062 to help bring this project to life. Thanks for checking out the CordLite! We've been working on the CordLite for almost a year now, and we're really excited to begin manufacturing, but we could use some help with the upfront costs. That's why we turned to Kickstarter. If you preorder a CordLite before the Kickstarter project is over, you can snag one at the discounted price of $30(includes US shipping), as opposed to $35 after Kickstarter. In addition, you would be among the first to ever get a CordLite, and you would have the satisfaction of knowing you helped get this product to market. You can choose from a few different options to pre-order, so check out the Reward levels on the right --> and see which makes sense for you. Thanks a ton! Since we made the video, we've been able to shave quite a bit of volume off of the CordLite. It's much slimmer and sleeker, and feels great. Tech Crunch - "Perhaps the niftiest thing about the CordLite is how you actually fire up those lights"
Engadget - "Scrap Pile Labs' CordLite sets out to point the way to a successful connection"
Mobile Magazine - "No more fumbling in your dark bedroom or in the dark confines of your car at night." Zagg - "...an elegant device that, if priced properly, would be on the want list of thousands." Uber Gizmo - "Looking to solve the issue of fumbling in the dark are Scrap Pile Labs"
Geeky-Gadgets - "...making it easy to connect it to your iPhone in low light conditions." Oh Gizmo! - "...the CordLite presents a solution to one of life’s tiny annoyances"
Phones Review - "...the CordLite compliments iPhone charging with illumination"
MyLovelyMac - "There are many interesting projects on Kickstarter.com which deal with Apple products, but the CordLite illuminated iPhone Charger is one of the most popular ones." App Advise - "...That’s why I’m so interested in the CordLite from Scrap Pile Labs." BiteMyApple - "Favorite Kickstarter Projects"
StuffTV- " At first glance you might mistaken the CordLite for just another iPhone charger, but it has a clever trick up its sleeve"
The CordLite is a charging cable that provides illumination, enabling you to see your charging port in any low light environment. It's so simple, that by simply picking it up or holding it, it illuminates. The touch design eliminates the need for buttons or switches and keeps the look clean and simple. We worked really hard to design the CordLite to compliment Apple's impecable design. CordLite is made of rigid plastic for the body, and bead blasted aluminum for the touch plates. 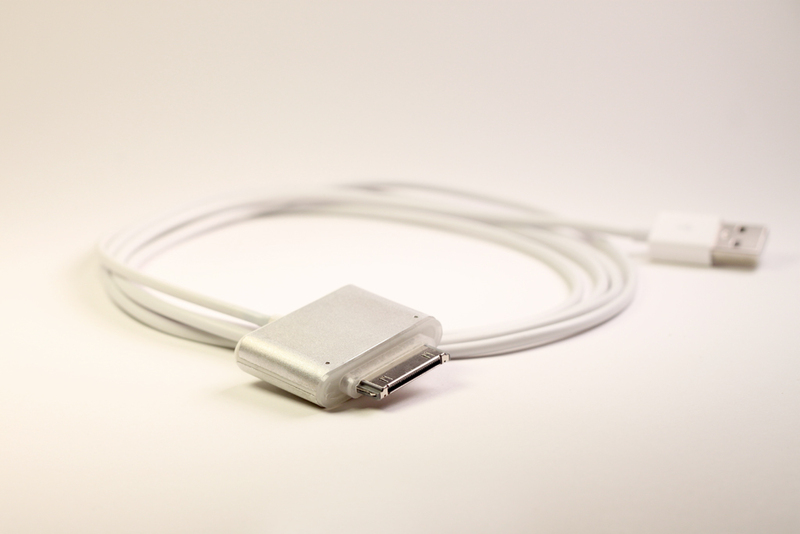 The cable is a standard USB cable and will charge and sync your iPhone/iPad/iPod just like the cable that came with it. The CordLite in the video is one of a few working prototypes that have been in use for the last few months. They were made in our shop using time consuming and tedious methods, but we were able to work out the glitches early and we feel really good about the design. 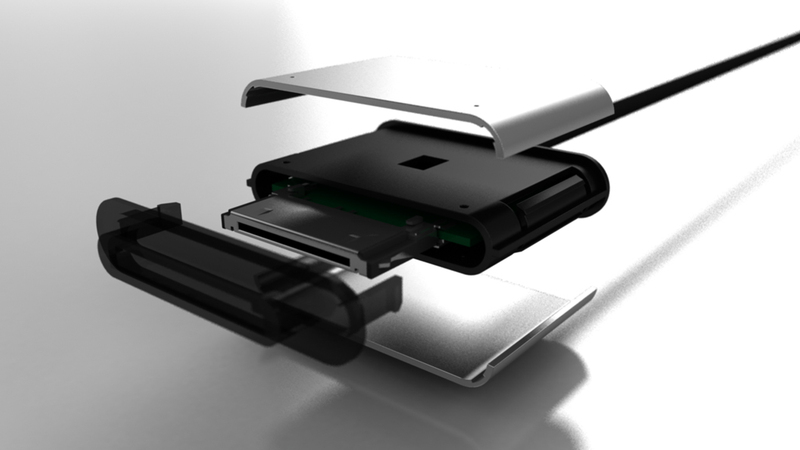 We are only offering the CordLite for the iPhone, iPad, and iPod in this Kickstarter campaign. 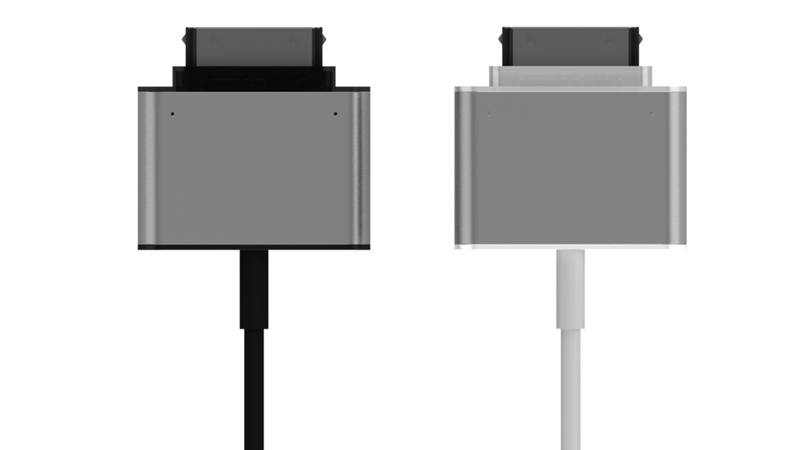 We have a MicroUSB version already prototyped, but because of production costs and schedule, we are focusing on the Apple version first. If you would like to follow the news about the MicroUSB version, you can sign up here. Each CordLite will come with bead-blasted aluminum touch plates, and a black or white plastic body. The cable color will match the plastic body. When the kickstarter project ends (if we're successful), we'll be sending out surveys where you'll get the choice of black or white. If you got more than one CordLite, in those same surveys, you'll let us know how many black and how many white. If you would like to add a little "Flair" to your CordLite... check out the Laser-etched Kickstarter Exclusive Reward level. Today's laser etching machines can burn super intricate designs into aluminum. "Lasered" designs add a cool dimension to your CordLite. The CordLite will require a number of manufacturing processes like injection molding and stamping, both of which are very costly initially, which is why we're here on Kickstarter. We've received several quotes for the manufacturing, both local and overseas, and both have their advantages and disadvantages. We prefer manufacturing locally to decrease lead times, and increase communication with our Manufacturers, but as the Kickstarter project matures, we will decide which route makes the most sense. Once the project ends in late-June, we will begin production right away. We'll be posting updates regularly and backers will be able to get an inside look at our progress through videos and photos. We're so excited to be releasing this product, and we really appreciate your interest in it. Without your support and generosity, we would not be able to manufacture the CordLite right now. We Thank You, and so does everyone that's ever had trouble plugging in their phone. THANK YOU! Get your name posted on the Scrap Pile Labs website as a contributor to the cause. Every dollar is a step closer to production. Help us kick it off, and get a great deal on a CordLite in our standard aluminum bead blasted finish. Your choice of Black or White plastic. After Kickstarter, each unit will retail for $35. Get a CordLite in our standard aluminum bead blasted finish. Your choice of Black or White plastic. Get the CordLite with a detailed laser-etched design chosen from the winners of the "Laser Design" Contest. <-- More details in the description to the left. EARLY BIRD TOO - A killer deal on two CordLites in our standard aluminum bead blasted finish. Your choice of Black or White plastic, or one of each. Two CordLites in our standard aluminum bead blasted finish. Your choice of Black or White plastic, or one of each. Get 10 CordLites in our standard aluminum bead blasted finish. Be among the first to carry a full stock of CordLites for your Retail Business. Get 100 units at wholesale pricing.